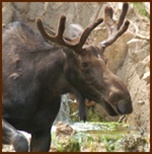 Our moose, Tahoma, is a big eater! He eats 25 lbs. of moose chow every day!